Mainline Super Mario games, developed in-house at Nintendo, are kind of a rare phenomenon these days. It’s a shame, seeing as each and every entry is incredibly polished, offers a bold reinvention for the series, and always caters to any type of gamer imaginable. From an outside perspective, the entire series defies expectations. At some point, we all just assume the Mario game will be finely honed, charming, and excellent to control, but most importantly, a phenomenal dose of fun to define the Nintendo console on which it appears. It goes without saying that the announcement of a mainline Mario game for the Nintendo Switch was met with enormous anticipation. SUPER MARIO ODYSSEY looked like the true sequel to SUPER MAARIO 64 or SUPER MARIO SUNSHINE. It appeared to be an invitation to take Mario to charming open-world landscapes full of secrets, with fantastic new abilities in a gorgeous artstyle. Having played the game almost nonstop since its release, I can confidently say it blows those expectations out of the water. SUPER MARIO ODYSSEY is built from the ground up with love. The music, the art, and the controls are all perfectly tuned to match the airtight 3D platforming gameplay. But none of this is a surprise. This has been a staple of the franchise since its first entry. 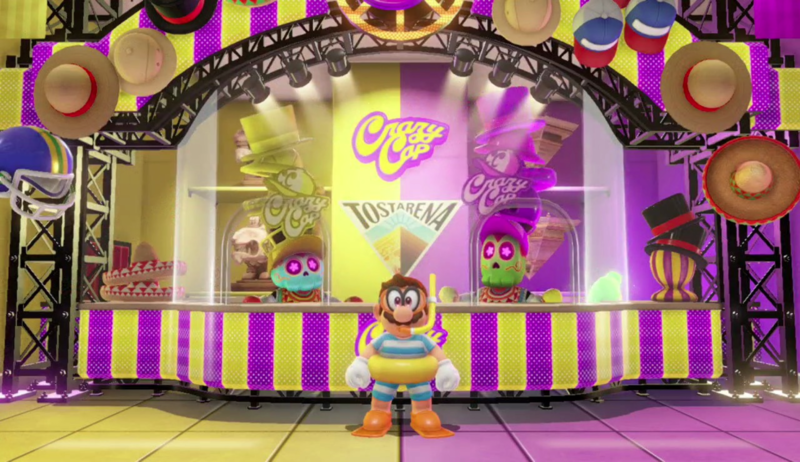 ODYSSEY’s true triumph is its acceptance of player experimentation and its willingness to let the player change the rules. Much like Zelda’s reinvention of itself earlier this year with BREATH OF THE WILD, ODYSSEY’s opening moments introduce the new mechanics and abilities before setting its players free. A single beam of light alerts the player to their primary objective, but it doesn’t mention how to get there or what needs to be done. It simply lets the player discover it all on their own. As always, SUPER MARIO ODYSSEY starts with Bowser boorishly kidnapping Princess Peach and planning the greatest wedding in existence. But, this time around, Mario won’t have to go it alone. 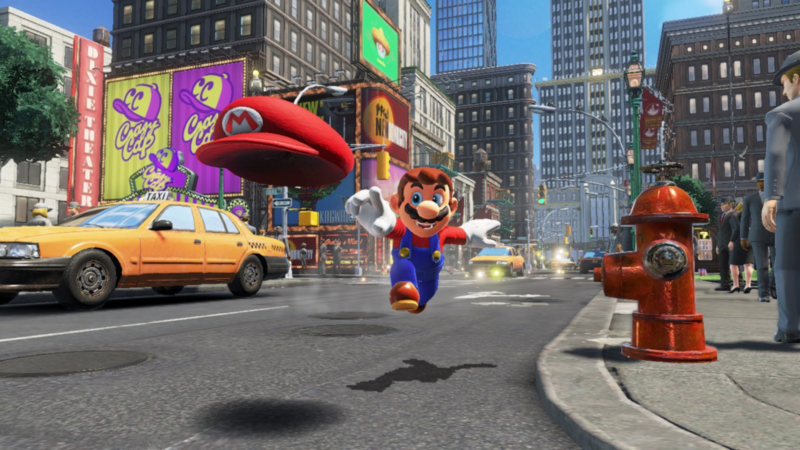 He is joined by Cappy, an animated hat with his own reasons for chasing after Bowser. Together, Mario and Cappy will take control of an airship, the Odyssey, and navigate the various kingdoms and worlds to chase down the vile reptile and save the girl. Each of the game’s small open-world levels offer numerous Power Moons to discover and find. These Power Moons function almost identically to Power Stars or Shine Sprites in earlier titles. 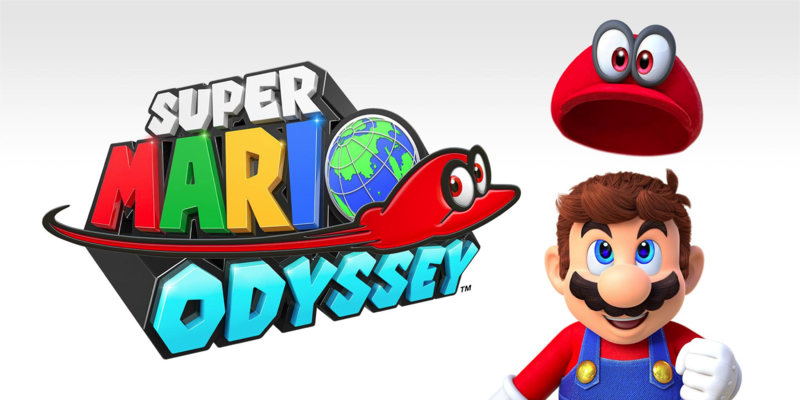 In order to advance to the next world, players will need to lead Mario to discover various Moons by discovery, experimentation, or completing various objectives. There is a list of all of the Moons available in a level, but without titles, context clues, or hints as to how to find them. It is the player’s job, then, to pull themselves outside the game world and think cleverly. If you were going to hide a Power Moon, where would you do it? One such Moon is simple and straight-forward: it spins brightly atop a tower. The real challenge is finding the means to climb that tower. Another moon won’t even appear on the map until certain challenges are met. A specific moon requires you to use the fire attack of an enemy to light torches around the world causing the Power Moon to appear within reach. Each world offers a few main objectives that reward Mario and Cappy with a Multi-Moon, a collectible worth three total Power Moons. But these main objectives are almost never enough to progress forward on their own, and so the hunt for additional Power Moons begins. For reference, I completed the main story of ODYSSEY with a total of about 200 Power Moons. 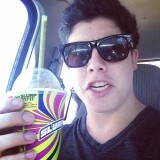 There are 999 of them hidden everywhere in the world. I have a lot more hunting to do. And like the gift that keeps giving, ODYSSEY encourages this by giving you new objectives and even worlds to unlock when enough Power Moons are discovered. 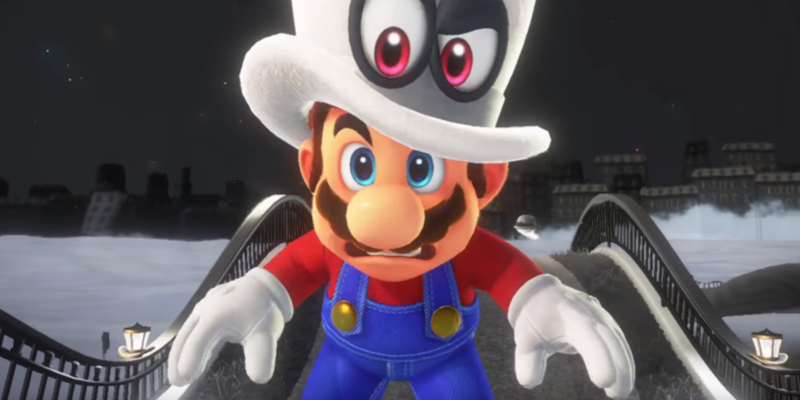 With Cappy on his head, Mario earns a few new abilities that differentiate this generation’s platforming plumber from his previous iterations. When tossing his hat at certain enemies, Mario will possess them and gain their abilities and new controls. Some possessions offer increased offensive capabilities, while others offer special abilities that completely change up the potential for discovery and advancement. Some worlds will require the abilities of a certain enemy type in order to progress forward. Aside from this possession, Mario can also toss Cappy midair to extend his jump distance, collect items, transmute himself into various environmental features, and plenty more. All of these additional functions are only discovered through extensive experimentation, and allow for a wide range of playstyles. But most importantly, ODYSSEY allows you to change Mario’s appearance through a variety of costumes. None of them offer any special abilities or anything, but when you see Mario in a Chef’s outfit or wearing samurai armor, you will understand. This new universe of capabilities, on top of Mario’s already stellar acrobatic abilities, broadens the player’s mind when it comes to exploration and platforming. Those tall towers blocking out your line of sight or walls sealing off your path are nothing more than puzzles encouraging the player to find new ways to scale vertically and break the level world somehow. But, rather unbelievably, after 20 minutes of attempts and an ultimate success, the player will find something behind that wall or on that tower. It is as if the game world is built to encourage aggressive attempts to break the navigation of itself, just to reward the player for their success with coins or even a Power Moon. Once, when trying to navigate to a main objective, I decided to leap onto an exterior wall and bypass rows and rows of perilous platforming only to receive a comment of “NICE JUMP!” from Cappy, encouraging my discovery. What would be an exploit in another game is just another added layer to ODYSSEY’s intricately crafted world. SUPER MARIO ODYSSEY is not a difficult game or a test of a player’s patience. But it’s not designed to be. If anything, ODYSSEY just reminds of what it was like to be a kid again, when video games were still full of untold mysteries and possibilities. ODYSSEY is a reminder of the pure, unadulterated joy that can be found in an expertly crafted game. It exists to offer an escape, a fun experience unlike anything else on the market. Mario games will never fall out of style because they offer this experience better than anyone, with nary a hint of a corporate agenda soiling the core message. ODYSSEY is a phenomenal addition to this treasured franchise and is a reason in itself to own a Switch. I’ve left a lot of this review vague on purpose, because the countless secrets ODYSSEY are best experienced first hand. And again, most of my praise shouldn’t come as a shock: Mario games are almost always great, with a higher standard of excellence than almost any franchise in the medium. But I cannot stress enough that SUPER MARIO ODYSSEY is one of the easiest recommendations I can make for literally anyone: if you can, go out and buy this game. SUPER MARIO ODYSSEY is my new favorite game in the series and clear sign that Nintendo is unafraid to evolve their most established franchises.